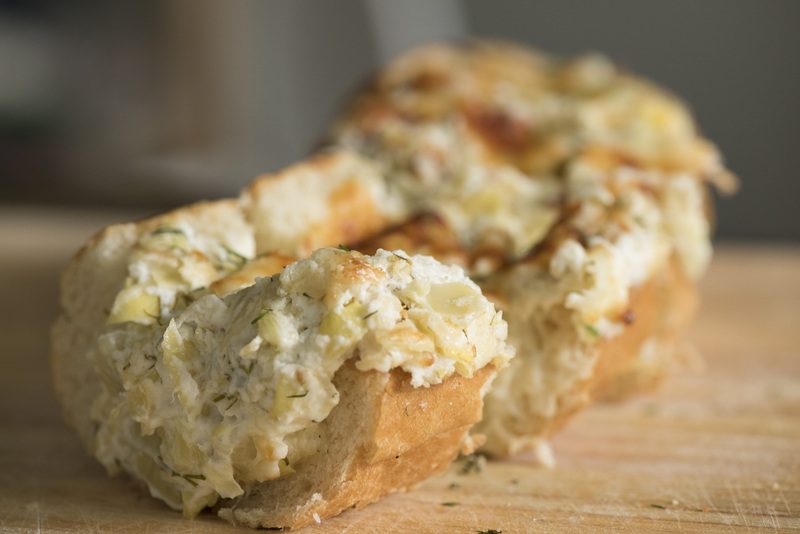 Who doesn’t love a piping hot bread vessel filled with cheesy artichoke dip? (We’re pretty positive we know the answer to that question.) Seriously, you need to make this right away. It’s a total cinch and it’s pretty much the best thing ever. It’s perfect for game night, movie night, (any night), potlucks, last minute company and snacking on absolutely anytime at all. You will not be sorry you made this – but you might be sorry you didn’t make more! Get ready to be totally satisfied! In a large bowl, whisk together sour cream, mayonnaise, cream cheese, 1/2 cup parmesan cheese, garlic, dill, salt and pepper until combined, then stir in artichoke hearts. Horizontally cut off the top 1/4 of loaf, then use a spoon or your hands to hollow out the center, making sure to leave 1/2-inch of space on the sides and bottom of loaf. Fill bread bowl with the artichoke mixture and top off with remaining parmesan cheese. Transfer to a baking sheet and bake 25-30 minutes. Let cool 5-10 minutes and enjoy!